Jori and Jim Manske, from Albuquerque,get ready to kick off a seminar about nonviolent communication at Mercy Regional Medical Center on Tuesday. How does a young woman in a Nazi concentration camp care about the kind of day a guard is having? Why does a young man in jail in Albuquerque say he's seeing life from a whole new perspective? According to the Center of Nonviolent Communications, now based in Albuquerque, the answer is compassionate listening and empathy. "Nonviolent communication is founded on the language and communication skills that strengthen our ability to remain human, even under trying conditions," Marshall Rosenberg, the founder of the center, wrote in his book Nonviolent Communication: A Language of Compassion. The young woman, Etty Hillesum, wrote about those moments of empathy in her memoir. The young man is studying nonviolent communication techniques as part of Comienzos, a program in the Albuquerque Metro Detention Center. 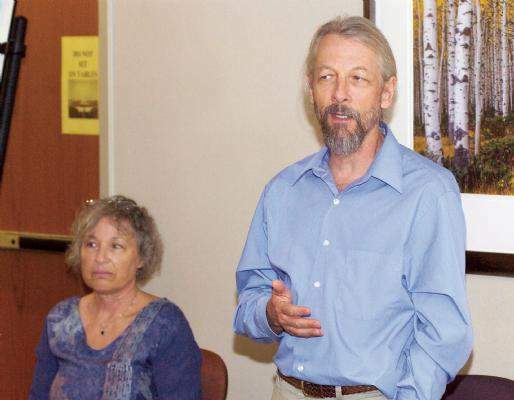 Earlier this week, Jim and Jori Manske, two of the 50 certified trainers in nonviolent communication in the U.S. and are working on the Comienzos program, presented numerous seminars and training sessions to staff members, health-care providers and the public at Mercy Regional Medical Center. They came to the Center of Nonviolent Communications after years of working as mediators. "Nonviolent communication helped me see how we all share some needs," Jori Manske said. "Being aware of underlying needs helped me understand why some mediations worked and others didn't." Her husband agreed, saying one of the benefits of learning the skills is it helps develop emotional intelligence and strengthened empathy. The Manskes use a judgmental jackal puppet to illustrate a person who is caught in anger and frustration and a set of giraffe ears to illustrate empathic listening. People attending the public seminar Tuesday night quickly used the tools to switch their thinking and approaches. Diana McKenna, director of the Spiritual Care Department at Mercy, has brought the Manskes in several times to teach the basic nonviolent communication skills. The technique includes observation of what's actually happening; feeling both physical sensations and emotions; recognizing needs, the resources required to sustain and enrich life; and making and honoring requests to contribute to the well-being of ourselves and others. "It provides a chance to clarify and not be so afraid about confronting," McKenna said. "In the fast-paced world of health care, we think we don't have time to do it, but saying 'This is what I need, can you do this?' may only take five minutes." Terry Swan, a retired Air Force pilot and communications professor at both the Air Force Academy and the University of Mississippi, read Rosenberg's book after a copy was given to his wife, Dinah. "I've been to war three times," he said, listing Vietnam, the Gulf War and Bosnia, with the conflict between Christians and the Albanian Muslim minority. "I've seen the results of violent communications, because the most evil result of communications in the world is armed conflict." The Swans attended a nine-day nonviolent communications seminar in Albuquerque with Rosenberg to work on their own interpersonal interaction. "I thought empathy meant you needed to agree and figure out how to fix things," Terry Swan said. "Often, all I want is for Dinah to hear my pain and know that there's another person in the world who understands how I feel." • The Center for Nonviolent Communication’s Web site is www.cnvc.org. • Tapes, notes and other information about Jim and Jori Manske’s Radical Compassion are available at www.radicalcompassion. squarespace.com. • A variety of lectures on non-violent communications is available.